The Australian High Commissioner and Public Service Minister launch the Pacific Institute of Leadership and Governance. The Pacific Institute of Leadership and Governance was launched in Port Moresby on Tuesday 1 May by Public Service Minister Elias Kapavore and the Australian High Commissioner Bruce Davis. Minister Kapavore said the new Pacific Institute of Leadership and Governance (formerly called the Institute of Public Administration and the Administrative College) is committed to the development and training of high-performing public servants throughout Papua New Guinea. “The launch of the Pacific Institute of Leadership and Governance represents much more than a change of name – it means the restructure and continued revitalisation of this historic institution,” he said. He said the Institute is focused on enhancing public sector performance and will forge public servants who will provide the practical, intellectual and ethical leadership for Papua New Guinea. “The institute is also extending training beyond Port Moresby, ensuring provincial, district and local level public servants are empowered to support their communities,” said the Minister. Australian High Commissioner Bruce Davis said the launch marks the start of a new era for the Institute, which is a core partner of the Pacific Leadership and Governance Precinct. 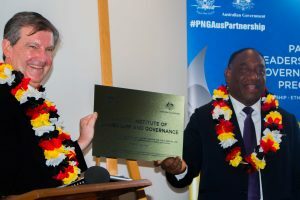 “The Pacific Institute of Leadership and Governance is a vital part of the Precinct, a partnership between Papua New Guinea and Australia that is supporting Papua New Guineans to fulfil their potential as ethical and capable leaders,” he said. The Institute will continue its strong partnership with the Australian Public Service Commission, supported by the Precinct, which has assisted with training and course design. This includes the new Diploma of Leadership and Governance that will commence next week. The Precinct has also supported the construction of the Sir Sere Pitoi Rumana; a new administration building; and a new resource centre to provide staff and students access to modern information technology services.